Anonymous 2405191458063842: DAP deputy secretary-general V Sivakumar says that some Indian Malaysians are turning away from Pakatan Harapan, after overwhelmingly backing the coalition in last year's general election. But what use are Indian and Chinese voters to Harapan now? Its leaders are chasing after those whose support it did not get in GE14. So they will bend over backwards to get those votes, and pretend to be deaf when their faithful Chinese and Indian voter bases complain about the hard times they are facing and the broken promises. The Harapan thinking seems to be that there are still four more years to go, so no need to entertain grouses from these bases. Only at the end of the fifth year, when the 15th general election is due, then they will pay full attention, throw in some goodies, and make a lot of promises to buy their votes again. All politicians in this country are the same. Lodestar: Indians were marginalised under BN rule, but after nearly a year under Harapan rule, they are no better off in terms of jobs, poverty alleviation and university places. 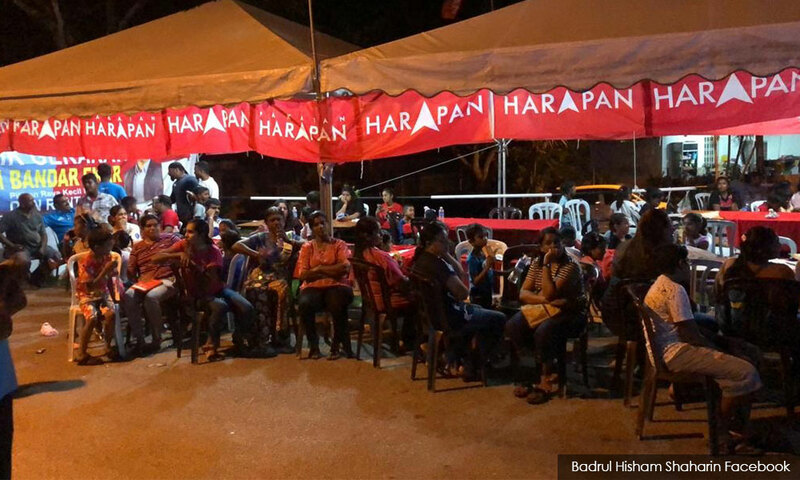 Harapan is taking their votes for granted in the belief that they won't go back to BN. But if there is a choice of the old BN or a new ultra-racist, Talibanese Umno-PAS government, many non-Malays may prefer the devil they knew. Indians may drift back to empower the MIC, so as to prevent the emergence of this horrendous Umno-PAS government. Anakraja: This is a good wake-up call for Harapan. The coalition promised a lot of things, but nothing has materialised. The low-income earners are still suffering due to the hike in prices of daily goods. Graduates are still jobless. And what is Harapan doing about it? It must be colourblind when offering jobs. Take the cream of the graduates and pay them well. Do not talk of bumiputera only, which is an old story. What about the Orang Asli? They were never given a chance to progress. Some 45 years ago, no one talked about race. With the education system we have in place today, all kinds of negative words are being said. Ace: The Harapan government must think out of the box, especially the Finance Ministry. With the lacklustre economy and the high cost of living, why is the government just pushing to tax the same groups of law-abiding, tax-paying citizens again and again? It is these same people who are bearing the burden, while many others do not even pay taxes at all. This is one big factor making Indians and Chinese reevaluate their support for Harapan. Malaysian Citizen: Kudos to the Indians who did not support Harapan! The Indians have become disillusioned with the ruling coalition for continuously sidelining them. Nothing concrete has come out of the Harapan mill after almost one year. The only things we've seen thus far are the Bumiputra Economic Vision and Malay rights. Harapan is heading towards creating history as a one-term government. The Way It Was: Harapan can't win every by-election, but the fact is that it is in power, not those thieves from Umno-BN who have plundered the country. Harapan has 40 months more to govern, and it has to do a better job of communicating with the people on its plans to improve their lives through education, healthcare, housing, transportation and jobs. The next general election won't be Harapan's to lose - if it does deliver. Kamikasi: The stupidity of Human Resources Minister M Kulasegaran to play racial politics in Rantau needs to be carefully scrutinised by all Harapan politicians. Kulasegaran still plays the old tune. Harapan must realise that its performance is unsatisfactory due to poor communication. Gone are the service centres to help communities. Most are incompetent, and after 11 months, there is hardly any report to track the performance of the ministries. Harapan is obsessed with the SRC International and 1MDB, but the people couldn't care less about the robbery. The Analyser: Come on, politicians. Open your eyes and face reality: the loss in Rantau had nothing to do with race. As long as you pretend that race is a factor, the longer will it take you to realise that you are the problem. Two-thirds of the voters of Rantau know what the problem is. How come it’s taking you leaders so long to wake up? RR: I see politics in the country has become a personality issue, rather than of welfare and future of the country. Instead of taking the country out of the rot and resolving the vast problems faced by the people, especially those in the bottom 40 percent (B40) income group, politicians are concerned with their own positions. Politicians competing for the prime minister's post must make sacrifices. If they are not capable of administering this plural society and taking care of the welfare of all, they should step down to give way to those who can. There is only one post for the prime minister, and only someone who is capable and has the support and love of the people should assume it. All cronies with an axe to grind should shut up and stop undermining the harmony in the nation. Fairview: It is very strange that we pay so much attention to our political analysts, especially those who hardly go to the ground. You can actually get a better perspective of what the Malaysian political situation is all about by sitting in a local coffee shop. Most of the time these analysts reinforce one another’s personal views based on their own inclination towards a political party or towards certain personalities. Anon 2000: The Indians and Chinese still don't trust de facto Harapan leader Anwar Ibrahim. In the past, he was seen as pro-Islam. Now, he is very happily mingling with the corrupt, racist Umno leaders and bowing down to royalty. He is unpredictable. The Analyser: Why is Malaysian politics so bogged down with irrelevant details? Why do race, religion and personalities feature so frequently? Why do pundits so readily blame someone else for their failings? Are you all so insecure that you need to find someone else to blame for everything? Are you all so ignorant that you ignore current developments and try to explain everything in terms of outdated and largely incorrect reasoning? Anwar and Harapan candidate for Rantau Dr S Streram had no specific role in Harapan’s loss. They are just a part of a team of losers. Get it into your head that there were no racial or religious trends to be identified, and if you want to pursue those avenues, all you are doing is fooling yourself. Umno-PAS similarly had little role to play in your loss. They were simply seen as a receptacle for voters' disillusionment. The undeniable fact is that the Malaysian people are totally cheesed off with everything that Harapan is doing. Salvage Malaysia: The people are very angry at the Harapan government and the stupid policies implemented. For the first time – from small traders, mamak stalls and right up to big businesses – everyone is suffering and may close shop. Anwar is not in government, and he has tried his level best to do damage control, but the anger of the people is getting stronger. The Finance Ministry only knows how to boast about penny-pinching, but has absolutely no idea how to grow the economic pie. It keeps coming out with badly timed policies that, while well-intentioned, are killing everyone's businesses when the economy is already in the dumps.